Early this morning, EJ looked out our big living room window, the place where the baby robins fell when I unintentionally pulled down their nest, and he exclaimed, “There’s a baby Robin on the ground below the window!” I had read (after I pulled down the nest) that Robins typically lay 3 to 7 eggs, and I had wondered if there had been more than the two I had found and rescued, but I hadn’t been able to find any more babies. But then, it’s not easy to search when angry Robin parents are screeching and swooping, and I have discovered that baby Robins press their bodies low and stay very still when strangers approach. I put on EJ’s straw hat, a sweatshirt, and gloves for protection against angry, screeching Robin parents, and went out to search for baby number 3. I couldn’t find it, and think it must be hiding in the tangle of ground cover. The dead leaves and old bird nests are the very color of baby Robins, so I could have uncovered the bird and never seen it. It will probably be ok in the tangled ground cover, and apparently Papa and Mama Robin have been caring for the two in the hanging basket and this one on the ground. My respect for Robins has risen high as has their position on my list of birds I love, like geese. EJ, our son, and I love geese and always pause to watch them when they fly overhead. We always pause for wondrous sights, like geese flying or delicate spiderwebs. 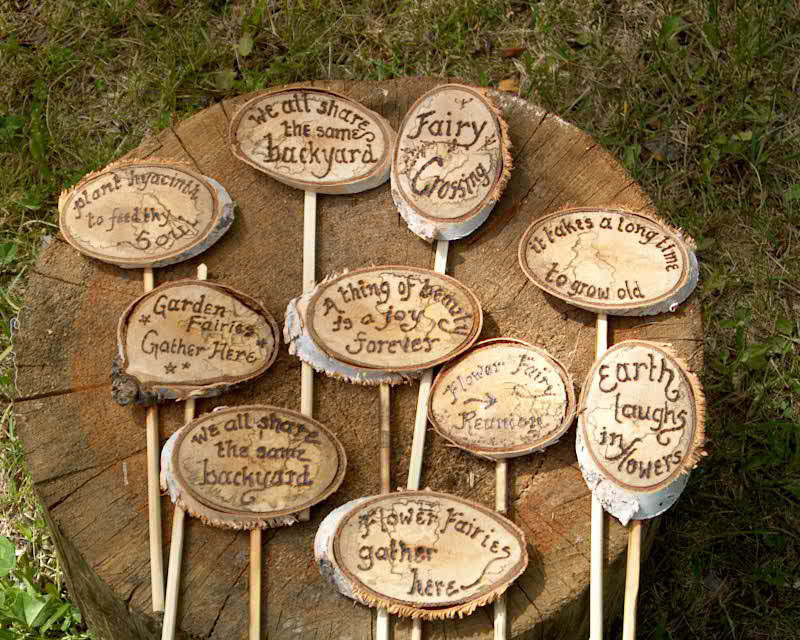 I am not sure I am ready for the drama of the garden. I was sad when the sparrows kicked the house wrens out of the birdhouse and killed their eggs. And I feel responsible for the survival of the little baby Robins, since I had put them in danger in the first place. But I have been thinking about what EJ said after I pulled down the nest and thought the baby Robins were dead. He said that life and death are part of the rhythm of life. And he is right. In life, there are sometimes sunny days, but there are also storms. It isn’t always day, there is also night. There is summer, but also winter. Sometimes people recover from sickness, but sometimes they don’t. Sometimes pain and tragedy comes, but it all has its season, its purpose, and through pain and tragedy can come growth and beauty. Like feeling horrified about accidentally pulling down a Robin nest, but then getting to enjoy a thrilling experience of observing the babies grow up. 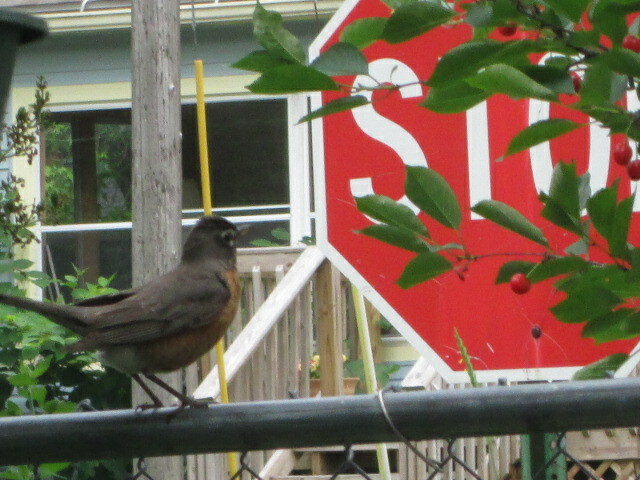 After I unsuccessfully tried to find the third baby Robin, EJ saw the Papa and Mama Robin eating the ripening cherries from our cherry trees. Apparently we have a Bird Bed & Breakfast–we nest them and feed them. So EJ went out to pick cherries before they all disappeared. I went out with him, but went out to the sidewalk instead of to the trees. “Aren’t you going to help?” EJ asked. “Not yet, I want to take pictures,” I replied. But I confess that I was really hoping to get dramatic video of the Papa and Mama Robin swooping and screeching at my husband so I could share it here and on Facebook. I was disappointed, though, because they didn’t do much more than chatter. Either they don’t see him as the Destroyer of Nests that I am, or the two of us together seemed too many to attack. So EJ and I picked cherries. Later, I set up the hose in the gardens. We have garden all around our house and it’s quite a task moving a hose from place to place. So I have come up with an ingenious system. A few years ago, I stretched hoses into various parts of the yard and then I detached the hose I didn’t need and attached the hose I needed. 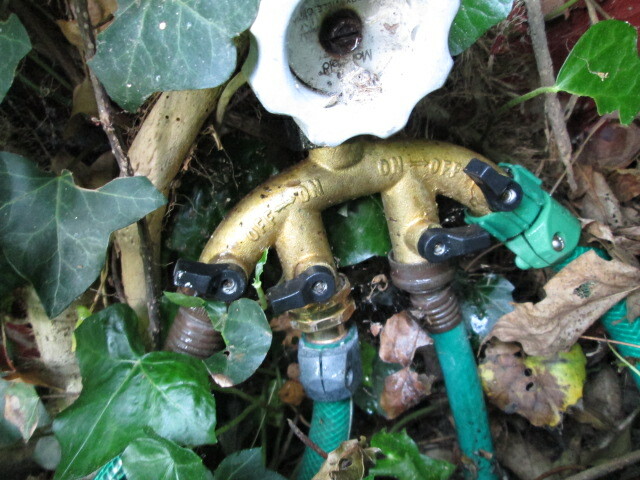 But last year while I was aimlessly wandering around the hardware store while my husband searched for some doodad he needed, I discovered and bought a valve thingy that allows me to hook up four hoses leading to different parts of the yard. On some hoses, I also have a two-hose valve thingy so I can branch off the hoses again. With this system, I can easily turn on some hoses and turn off others, as needed. It actually works. I am quite proud of myself. Today as I set out the sprinkler in my herb garden, I accidentally got sprayed in the face, but since it is so hot outside, it wasn’t a bad thing. Mostly it was just a surprise. It is really hot and humid today. The weather app on my computer said earlier that it was 84 degrees but had a “realfeel of 96.” Everyone seems to think hot weather is a paradise, but I am a northern girl, and I love my northern state, and I melt when the temps rise too high. So I didn’t work outside much, but instead pitted cherries at the sink. Pitting cherries always makes me think of when I was a child. We had about four or five cherry trees and one year we must have had a bumper crop. We picked and picked cherries, and then a neighbor let us pick the cherries from his tree. (We had enough for my Mom to freeze 80 quarts.) Of course, after picking comes pitting–and we pitted and pitted. I was wearing a brand new matching shorts outfit for the first time and the cherry juice stained it horribly. So ever since then, whenever I am picking and/or pitting cherries, I always make sure I am wearing old clothes I don’t care about. I don’t especially like to pit cherries. There are some tasks I don’t particularly like to do, but I always try to find a way to make those tasks enjoyable. Today, I looked out my kitchen window and watched the sparrows at the birdhouse. I also watched fluffy clouds that will turn into storm clouds at some point. I love clouds. I saw the Papa and Mama House Wren standing on the birdhouse as if they were considering buying it. They checked it all over, discussed it, peeked inside, and then realized it was occupied and flew off.